Nicole loves decorating for Christmas. This is the first Christmas they’ve had in their house and she and Chad have been busy decorating. She posted this picture the other day. 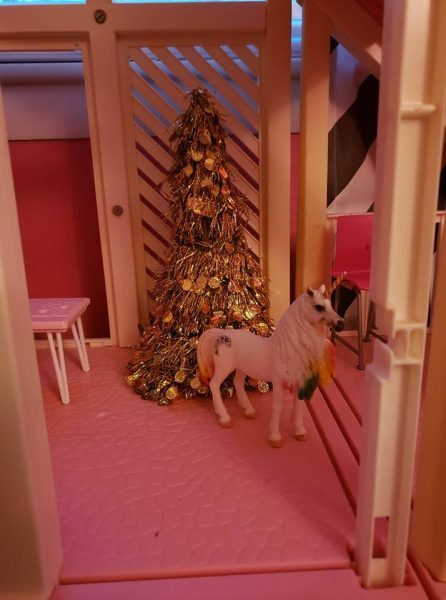 Addie put a Christmas tree in her Barbie house. Vince said he saw the other day where someone had 3D printed a toilet for Barbie’s house. That got me to thinking about all the things he could be making for Barbie. Nicole sent me a picture of Addie opening the Day 3 advent gift. It was a book and not nearly as exciting as a toy but look how long her leg looks in this picture. There should be no way she can be long legged. Nicole isn’t tall but does have fairly long legs. Chad isn’t tall. 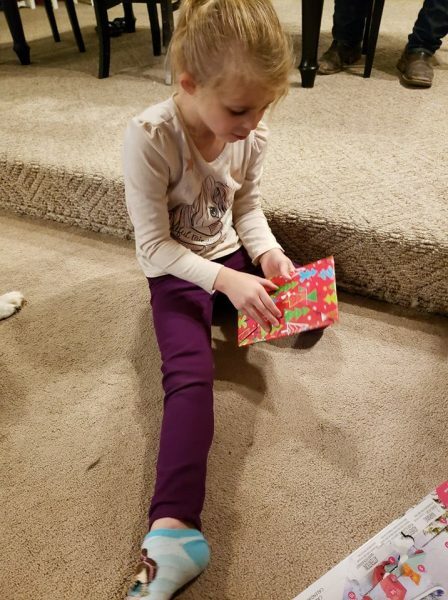 Every time I see Addie in her gymnastics suit, I’m surprised at how long her legs look. Those are jeans I bought when I was there in October. They were a little too long and they look like they’re just about the right length now. She definitely is growing too fast for my liking. She is growing up real fast! So pretty!